Does breast MRI hold future for mammography market? March 8, 2017 -- Breast imaging is a highly contentious area and one of the most fiercely debated across all of radiology. Almost every month, alternative guidance on comparative use of traditional digital mammography, digital breast tomosynthesis (DBT), traditional and automated breast ultrasound (ABUS), and breast MRI is offered, followed by a raft of rebuttals and consternation. Interestingly from a commercial perspective, this has not stopped DBT or ABUS from making steady market penetration in Europe as alternative options to conventional mammography. In stark contrast, breast MRI, has made little impact to the commercial MRI market, despite potentially holding the greatest potential and clinical value. Recent surveys suggest MRI mammography (MRM) accounts for as little as 2% of MRI scans performed in Europe. * Denotes countries with reimbursement allowing or more open to MRM use. Source: European Cancer Observatory (ECO); COCIR "Imaging Equipment Age Profile & Density 2016." 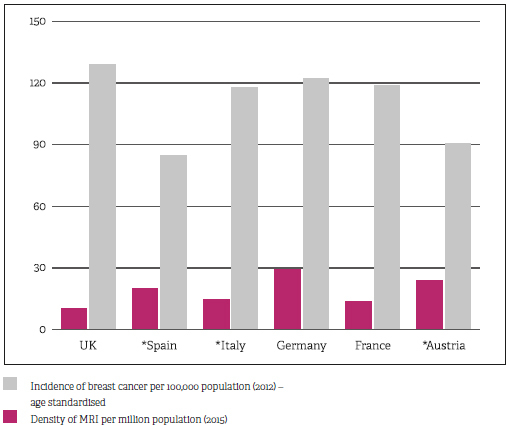 Across Europe, variance in MRI density and incidence of breast cancer varies significantly among countries. Most consistent data available for per country breast incidence are for 2012 data (ECO). Clinical evidence supporting the use of MRI for breast imaging is growing in volume and credibility, such as the recent findings that a follow-up MRM scan for patients with equivocal findings from conventional mammography offered "absolute certainty" for tumor detection. While further evidence and larger trials are required, such evidence suggests MRI has a significant role to play in breast imaging in the future. So why have we seen little or no commercial impact from breast MRI? The first and most complex barrier to adoption is the varying degree to which breast MRI is regulated and reimbursed across Europe. Very few countries have breast MRI incorporated into common screening and diagnostic pathways, let alone reimbursed, especially in Northern Europe. Some Southern European countries have more flexibility for breast MRI use, though only Austria in Western Europe has full reimbursement for breast MRI. Increasing adoption of breast MRI is also no mean feat -- research on use of DBT and breast ultrasound has been ongoing for many years, yet large-scale uptake into screening programs has remained contentious; even the effectiveness of conventional mammography screening continues to be debated. More positively, the emergence of DBT, ultrasound, and MRM, especially in the context of breast density, has raised awareness that the current "one-size-fits-all" approach may not well serve all patients. Instead, prescreening of breast density measurement is gaining momentum, especially in the U.S., allowing a more adaptive approach to screening. 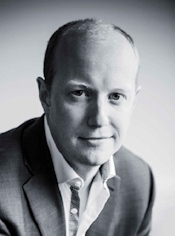 Stephen Holloway is principal analyst and company director at Signify Research. From a technological view, MRI has improved vastly to cater for a huge array of applications and remains the "gold standard" for imaging. The technological capability for repeatable, quality MRM already exists. However, as in other more routine scans such as abdominal and cardiac MRI, greater optimization and automation are required before large-scale breast MRM is viable. This includes design of shorter MRI protocols, reducing the current scan time of between 15 and 30 minutes, to under five minutes. In doing so, this will enable greater patient throughput and lower costs per exam. Additionally, specific focus on developing technology to increase the speed of breast MRI reading is essential, especially with the growing crisis of radiologist shortages across Europe. Above all, the cost of MRI remains the biggest hurdle to market penetration. MRI is an expensive modality in comparison to conventional mammography and ultrasound. Most of the current installed base of MR are oversubscribed, making the case for wider use of MRM harder. There are also other financial considerations to account for. Most arguments for use of new modalities for established clinical practice focus on relatively simple cost analyses. However, in the case of screening, the issue is wider. Rarely has return on investment (ROI) analysis been conducted to include the impact MRM may have on reduction in false positives, radiologist time, fewer biopsies, and, of course, quality of patient care. Over time, implementation of clinical analytics will help to identify this for providers, but today most providers and front-line screening institutions do not have the necessary IT infrastructure to easily provide such a complete picture. So, while MRM has initially shown great potential for improvement in mammography screening and diagnosis, its widespread adoption is far from a certainty. Only with a concerted effort -- both in terms of clinical research and a more complete analysis of the benefits to providers and patients -- will it become a central tool in European breast imaging. Originally published in ECR Today on 2 March 2017.